The first Giant Chinchilla was born in Kansas City, Missouri, on Christmas Day in 1921. Her very proud creator was Edward H. Stahl. She was exhibited the following year and was called the Million Dollar Princess. Now the breed is called the Million Dollar Rabbit. 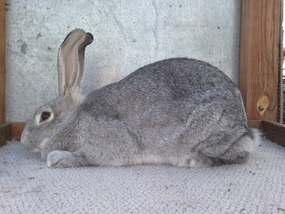 Stahl perfected this breed by using over weight Chinchillas and White Flemish Giants, just to name a couple of breeds used. The Giant Chinchilla has been purebred for over 45 years. The Giant Chinchilla Rabbit is one of the few rabbit breeds that was created in America. Although it is mostly bred for showing these days, the Giant Chinchilla is still judged on its commercial value, with meat-producing qualities scored highly on the show table. According to the American Livestock Breeds Conservancy (ALBC) the Giant Chinchilla is on the Watch list which means there are fewer than 200 annual registrations in the United States and an estimated global population of less than 2,000. The Giant Chinchilla grows very fast when young and will weigh between 5-6 pounds when only 8 weeks old and 7-9 pounds at 12 weeks old. Giant Chinchillas have no competition when it comes to producing meat fast and cost efficiently. The ideal Giant Chinchilla should weigh, when fully mature, 13-14 pounds for bucks. Does at maturity should weigh 14-15 pounds. The Giant Chinchilla has a very soft, silky coat of dense, medium length hair. Chinchillas have agouti coloring, where the hairs have different colour bands along their length. The undercolour (next to the skin) is dark slate blue, the middle colour band is pearl and the tips of the hair grey. Black 'ticking' (guard hairs) are unevely distributed over most of the body. The belly, neck, flanks and eye-cirles have pale, pearl ticking and the ears are laced with black. The color is chinchilla which is also found in many other breeds. I really like the looks of Benny and his width and depth. He is growing well and I am excited to add him to my lineup of bucks. I really like the looks of this buck. He has a nice strong shoulder, good rise and very full hind end. Great ring color too. ​This buck has great comments by every judge he has shown under. He has great fly back fur, a nice rise and solid body. Excited to breed him into our does. Very pretty doe out of one of my best producing does Amber. She is a sweetheart too. She has very nice type and has been producing some very nice babies. Thank you Carrie for this beautiful doe. Sorry to see you out of Giant Chins though! This is a really nice doe I am excited to add to the herd and see how she produces. She will also be shown some and try to grand her out as well.